Baby one - Nina, 3 weeks old today, enjoying her second pram outing. A good hike for her parents too, as we walked to this spot all the way from home and back, a 2hr hour walk. Baby two - Phil's NoSpuds bag, or more precisely, NoSpuds. 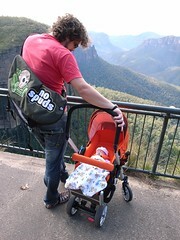 This baby was delivered just before Nina, and can be viewed online at www.nospuds.com.au. Feedback welcome!